The kapha dosha benefits from a diet that contains whole foods and spices which are dry, light, and warming. They should lower mucus production and support digestion and elimination. Foods should be eaten as three small meals with minimal snacking in between. Kapha tastes include bitter, pungent, and astringent. Practice yoga for 15 minutes every morning. Include sun salutation in your practice. Add pranayama to your practice especially Kapal Bhati or breath of fire. Note contraindication before practicing. Kick start your weight loss with Kapha dosha detox. You can check out the Fab & Glowing detox program here. In order to improve the digestive power or Agni try the turmeric-ginger pickle recipe and consume this before every meal. Include the following Top 10 Ayurvedic Food for Fat-burning and Kapha Dosha Balancing in your diet to accelerate weight loss. Turmeric is a rhizome in the ginger family that has a long history of use as a food and a healing agent. It is a staple in Ayurveda and Asian cuisine and has become more popular in the West. It contains many constituents such as curcumin, volatile oils, and antioxidants that have many effects on health. Turmeric helps with digestion and weight loss by suppressing body fat accumulation. Try this amazing Ayurvedic Golden Milk Recipe for weight loss. One study showed that curcumin – an important antioxidant in Turmeric decreased body weight, fat mass, lipids, blood sugar, and increased insulin sensitivity. It also stimulated fat breakdown and lipase function. I am in the process of finishing of my new kindle ebook on Turmeric and will share with you once I publish. Bitter gourd (or bitter melon) is a popular ingredient in South East Asian cooking. I have a great stir fry recipe here. Bitter gourd or bitter melon can reduce the weight of white adipose tissue and visceral fat, while reducing leptin production. It can reduce triglycerides, lipids that contribute towards weight gain. In addition to targeting fat, one of the more known benefits of bitter melon is for lowering blood sugar. In fact, there are numerous studies showing decreases insulin resistance, increasing glucose uptake into cells, upregulation of the insulin receptor, and increased beta-cells in the pancreas (which make insulin). Kokum is a plant in the mangosteen family who fruit is used in Southeast Asian countries, and provides a sour taste to food. It is known as Garcinia indica which contains hydroxycitric acid (HCA) and garcinol just like Garcinia cambogia. Studies on HCA show that it helps in weight loss and suppressing fat accumulation. Kokum can be found dried and used in food similarly to tamarind. You can add it to foods such as curries, vegetables, lentils, okra, fish, chutneys, and pickles. You can try my Easy Dal recipe and add kokum to it or try the mung dal recipe for weight loss with kokum. Cinnamon is a very popular spice around the world, added to foods and especially desserts. But other than its pleasant taste, it has many health benefits. It is widely used in India to treat diabetes. There are many benefits to consuming cinnamon especially for weight loss. Studies have shown that cinnamon lowers triglycerides, cholesterol, and blood sugar. It has insulin-like activity and increases the uptake of glucose into cells. It increases our body’s production of antioxidants (glutathione, superoxide dismutase) and contains many constituents and polyphenols which help against the development of degenerative diseases. It was also shown to decrease body weight and visceral fat. A simple cup of cinnamon tea or Kadha or Immune Boosting Tea recipe can assist with both weight loss and immune defense. Ginger is the ultimate thermogenic food that the kapha body type loves for weight loss. Ginger contains many active constituents including gingerol that has many health benefits. Studies show that ginger aids in weight loss by lowering triglycerides and lipids. It also lowers blood sugar and enhances the action of insulin. Gingerol was found to increase our body’s production of antioxidants such as glutathione, superoxide dismutase, and catalase. These help counteract free radical damage. Try this amazing Turmeric-Ginger Pickle recipe for weight loss. Sugar and carbohydrates are usually associated with weight gain, but the Ayurveda tells us that honey is heating and therefore Kapha pacifying. Honey is a much healthier alternative than other sweeteners. Raw, unpasteurized honey contains enzymes, amino acids, vitamins, minerals, antioxidants, flavonoids, phenolic acids, and carotenoids. It is anti-bacterial and wound healing. Studies have found that honey lowers body weight, triglycerides, and leptin levels – a hormone that causes weight gain. If you can getting a sweet craving try my Homemade Naturally Sweetened Strawberry Jam recipe that is made with honey. 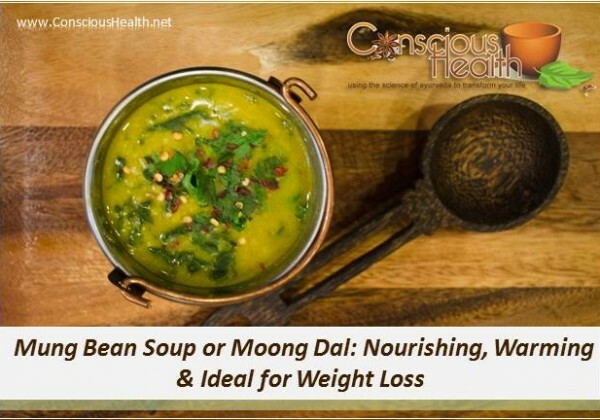 The most popular Ayurvedic food for weight loss is a nice bowl of Mung Dal Soup! Mung beans are nutrient-dense legumes, containing folic acid, magnesium, B vitamins, fibre, iron, zinc, and protein. As with many other legumes, it’s best to soak them in water before cooking to decrease phytates and anti-nutrients, and to combine them with spices, as is commonly done in many cultures. Mung beans contain a good amount of fibre (1 cup gives you 7g fibre) and protein, which make you feel full and eat less, as well as balancing your blood sugar. You can try Green Papaya and Moong Dal recipe, Moong Dal for Weight loss or the Oats Khichari recipe from my website for weight loss. Green leafy vegetables or any type of saag are amazing bitter foods in Ayurveda for weight loss, fat burning, reducing mucus and balancing Kapha. These foods fall under bitter and astringent, therefore ideal for Kapha dosha balance. They are a MUST for every day meals! Adding leafy greens to you regular diet will completely transform your health. Leafy greens such as spinach, kale, beet greens, mustard greens, collard greens, watercress, arugula, cilantro and parsley leaves are packed with vitamins, minerals as well as small amount of proteins. Try my Sprouts, Baby Kale and Avocado Salad recipe for lunch! Fenugreek seeds are a legume whose seeds are used as a spice and leaves are also common in many Asian recipes. It is especially good for kapha and vata doshas and helps remove excess mucus associated with kapha. The seeds contain protein, B vitamins, folate, minerals, iron, flavonoids, diosgenin, volatile oils, and a lot of fibre. In fact the seeds are about 45% fibre (soluble and insoluble) and this fibre is responsible for many of its effects on weight and health. Studies show that fenugreek decreases cholesterol, blood sugar, and decreases insulin resistance. One study also found reduction in body weight, BMI, adipose tissue weight, and leptin in animals (47-50). See my fenugreek sprouts recipe which could be easily used for weight loss. Ayurveda recommends small amount of ghee even for Kapha dosha. Ghee is clarified butter that has the whey, casein, and lactose removed. It is extremely popular in South East Asian cooking and many foods and spices are cooked in ghee. Certain spices actually release their volatile oil and increase in absorption after cooking in ghee. Ghee contains conjugated linoleic acid (CLA), antioxidants, and butyric acid. Butyric acid is a short chain fatty acid that is also made by our gut bacteria. It is absorbed by colon cells to be used for energy and is also anti-inflammatory. CLA is shown to reduce fat accumulation and leptin levels. Read more about Benefits of Ghee in my previous blog. options). This program explains your dosha and guides you in a detoxification with food and lifestyle changes. It also provides a detailed meal plan, many recipes, a shopping list to keep you organized, a supplement guide, and so much more. It makes detoxification easy and healthy! Bharat B. Aggarwal. Healing Spices: How to Use 50 Everyday and Exotic Spices To Boost Health and Beat Disease. Sterling: 2011. Pan Y et al. Curcumin improves glycolipid metabolism through regulating peroxisome proliferator activated receptor γ signalling pathway in high-fat diet-induced obese mice and 3T3-L1 adipocytes. R Soc Open Sci. 2017 Nov 15;4(11):170917. Fachinan R et al. Effectiveness of Antihyperglycemic Effect of Momordica charantia: Implication of T-Cell Cytokines. Evid Based Complement Alternat Med. 2017;2017:3707046. Krawinkel MB et al. Bitter gourd reduces elevated fasting plasma glucose levels in an intervention study among prediabetics in Tanzania. J Ethnopharmacol. 2018 Jan 12;216:1-7. Vasques CA et al. Hypolipemic effect of Garcinia cambogia in obese women. Phytother Res. 2014 Jun;28(6):887-91. Reza Alizadeh-Navaei et al. Investigation of the effect of ginger on the lipid levels. A double blind controlled clinical trial. Saudi Med J. 2008 Sep;29(9):1280-4. Aljadi AM, Kamaruddin MY. Evaluation of the phenolic contents and antioxidant capacities of two Malaysian floral honeys. Food Chem. 2004;85:513–518. Jing Gong et al. Effect of fenugreek on hyperglycaemia and hyperlipidemia in diabetes and prediabetes: A meta-analysis. J Ethnopharmacol. 2016 Dec 24 ; 194:260-268. Shen P et al. Effects of conjugated linoleic acid (CLA) on fat accumulation, activity, and proteomics analysis in Caenorhabditis elegans. Food Chem. 2018 May 30; 249:193-201.